As the Lincoln Center prepares for their upcoming renovation and expansion, they cleared some files out of their space and sent previous show programs our way. The Local History Archive is excited about this new collection, which contains items like the 1985 program for Brighton Beach Memoirs starring Patrick Dempsey. Although Dempsey started acting at age 15, this was one of his early roles on stage. Playing the lead role and protagonist, Dempsey had an impressive performance according to reviewer Frank DeCaro. 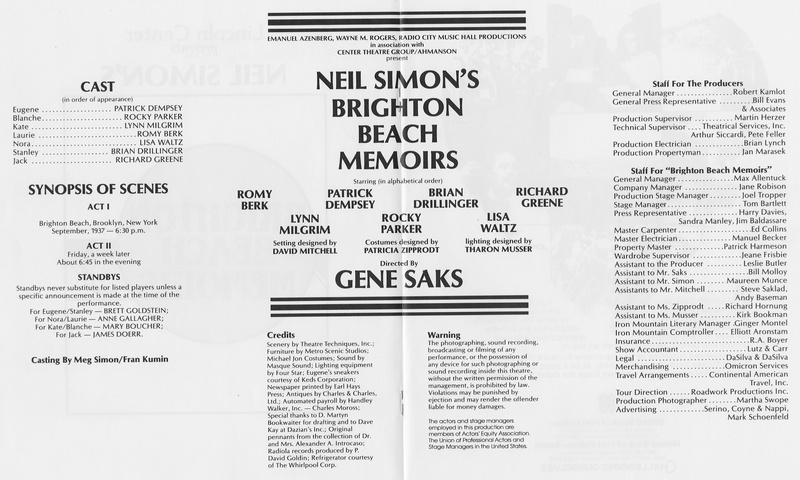 DeCaro’s review appeared in the Coloradoan the morning after the show with praise for Brighton Beach Memoirs saying it “evoked waves of laughter and washed away every fear that [Neil] Simon’s humor had all but dried up.” DeCaro commended Dempsey’s vocal and physical strength as the lead role and even called him “superb.” Within a few years of Dempsey’s presence on the Lincoln Center stage, he landed roles in TV movies and appeared on the big screen by the late 1980s. Most of Dempsey’s fame has evolved from his role as Dr. Derek Shepherd on the television show “Grey’s Anatomy.” McDreamy fans everywhere can trace his acting roots back to early performances like Brighton Beach Memoirs. Anyone remember going to this show? Anyone wish they were around to see McDreamy on the Lincoln Center stage when he was just 19 years old?